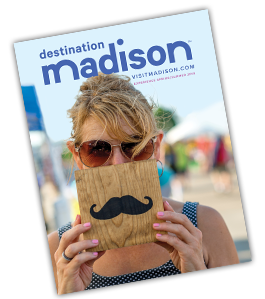 When you visit Madison, you&apos;ll quickly discover it is a place where the performing arts are plentiful! From catching a touring Broadway show to laughing the night away while watching improv, there is world-class entertainment to be found nearly every night. Going to galleries and museums will also make your visit memorable—don&apos;t miss Madison&apos;s "museum mile" which stretches from the capitol to the UW-Madison campus. Plus, there are treasures to be found in all of the surrounding towns that make up the Greater Madison area. We&apos;re also known for our love of live music. Our capital city is dotted with classic clubs and signature settings that have concerts nearly every night of the week. The city&apos;s robust fairs and festivals season is one more reason to mark your music calendar for a visit to Madison.